It's surprising just how many video games have been turned into board games. Next year, a new title will be joining the list, one that sees its high-speed gameplay transition from the screen to a slower, tabletop incarnation. Get ready for Street Fighter: The Miniatures Game. Having only recently launched its Kickstarter project, Street Fighter: The Miniatures Game has almost doubled its $400,000 target with 25 days still left to go. 3870 backers are so taken by the idea that they’ve pledged $756,676 at the time of writing. There are a number of video game-themed board games available that don’t sound like they would work outside of a console or PC: The Witcher, Portal, Assassin’s Creed, Gears of War, Bioshock, World of Warcraft, Resident Evil, Doom, and more. There's even a Street Fighter tabletop title already in existence, though it's a deck-building card game. With Street Fighter: The Miniatures Game, 2 to 6 players simulate fights using dice and cards. Battles consist of drawing two cards from your deck, moving (up to a character’s movement value) in any direction, then using two extra actions to move again, draw a card, or play a card. Card actions include strike attacks, projectiles, special attacks, or events, and players roll a dice to determine their success. Defending players, meanwhile, can either block or counter-attack, the success of each action again being determined by dice rolls. Players can even use destructible terrain to their advantage. One of the most compelling elements of the board game is its miniatures representing Street Fighter characters. These range from 6.5cm (2.5 inches) to 8.5cm (3.3 inches) tall and looks so good that some collectors will likely buy it just to their hands on them. The $80 base version gets you eight mini fighters, while the $140 product includes any that are added through stretch goals. If you can’t get enough of these figures, a $280 option gets you everything plus four expansion packs each containing four extra characters. 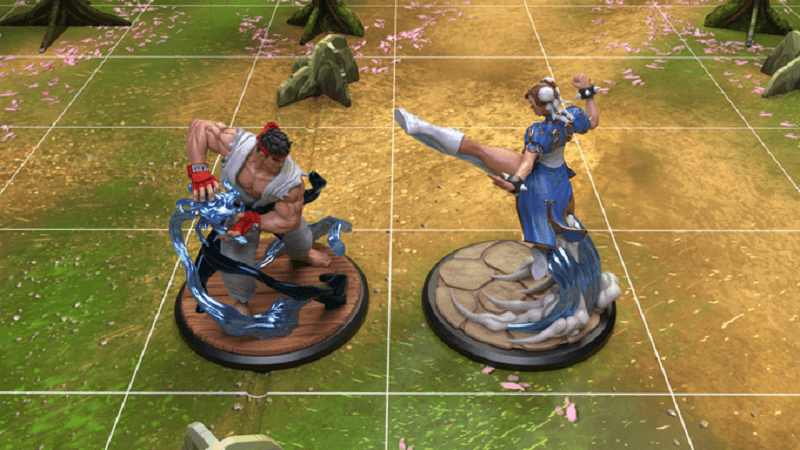 Make sure to check out Street Fighter: The Miniatures Game at its Kickstarter page. The estimated delivery date for backers is March 2019.